A great way to see our mystery country is to cruise its legendary river. 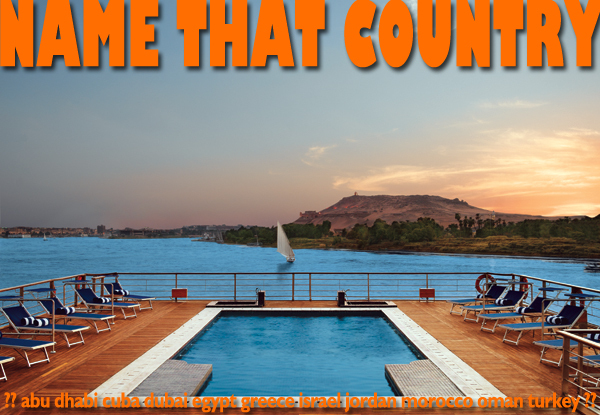 Weekly 3 and 4 night cruises travel between Luxor and Aswan in the south of the country. Cruises spend the better part of each day in port to allow passengers to see the sites. These cruises are not destinations in and of themselves but floating hotels moving passengers between the centers of touring along the river. Daily group tours are included in the cruise fare. Tour highlights include some of the most awesome cultural/historical remains anywhere. Karnak Temple and the Valley of the Kings top that list. Traditional life, little changed through the millennia, continues on the river banks, and is as impressed on my memory as any of the country’s grand monuments. This mystery country is Egypt. Click to see Egypt tours. This entry was posted in Egypt, name that country quiz and tagged aswan, Egypt, egypt tours, luxor by yalla2013. Bookmark the permalink.